I completed my In2ScienceUK work experience, placement at the UCL Experimental Psychology labs. The experience was incredibly insightful and just what I needed for me to confirm and strengthen my interest in Psychology. It introduced me to the heavily scientific and research aspect of psychology outside of what I had learnt from the AS curriculum. I was incredibly lucky to have observed Lucia Magis Weinberg and her supervisor Dr Iroise Dumotheil and Dr Ruud Custers on one of their busiest study days which continued into the week. Lucia is investigating executive functions (which are the mental resources needed to control behaviour and achieve a goal and how they related to activity in the prefrontal cortex of the brain throughout adolescence. To achieve this, she is running self-programmed computer based tasks that participants do inside a ) scanner. Whilst in the scanner, structural and functional images of the participants’ brain are obtained to show brain activity whilst participants are doing the tasks. During my time at UCL I have really felt part of the research . On experiment days I greeted participants and helped them fill out two essential forms. The first one is a metal pre-screening form, which is especially important for studies that involve the use of an MRI scanner. Whilst the MRI scanner is mostly safe, precautions must be taken with metal materials as the scanner is a gigantic magnet! No metal materials can be on a participant and/ or in their bodies. Therefore it is necessary that participants are screened before the experiment begins. Another very important form that a participant must fill out is the informed consent form. The researcher must thoroughly explain what the participant will be doing throughout the experiment, before they can sign the consent form. Once the forms are filled out the participants get to practice the tasks that they will carry out inside the scanner. I got to sit in on these and even got to do the experiment tasks myself! During the experiment I got to see how the researchers operated the MRI scanner from the consultant room and saw how the images were being developed as the scanner produced them. Whilst they were being processed, the researchers explained to me how the images are used to observe brain activity. I have been introduced to many different types of software that makes the tasks, data collection and data analysis possible. 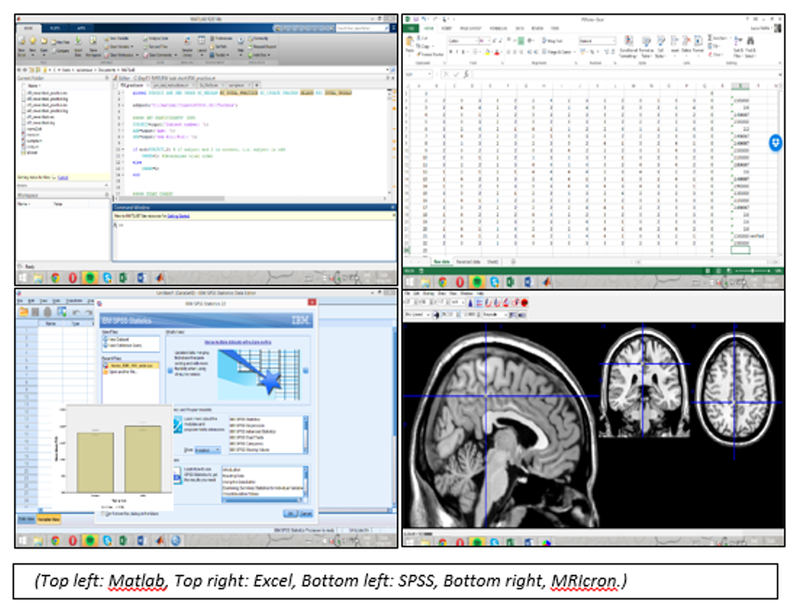 Matlab is a software that allows you to program the experimental tasks that the participants do in the scanner, it is also programmed to collect all the data from how they performed on the tasks such as accuracy and reaction time. The researcher has to input some of the data, such as the data obtained from questionnaires or non-computer based tasks, into the programmes, which is the part of data collection that is most susceptible to human error. When I was inputting participant questionnaire data into excel I had to recheck multiple times to ensure the data is accurate. I gained many computing skills which include using formulas and making pivot tables in Excel and using SPSS software for data analysis. SPSS creates graphs and performs a T-test which uses the mean and the standard deviation of the data to calculate t and p values. These values indicate whether there are statistical differences between two groups of data. Another programme used for data analysis that I encountered was MRIcron which converts the scanner image data into 3D images that you can work with. I used this programme to obtain structural images that we could send to the participants. Lucia has been extremely helpful in discussing university options with me and career options after a psychology BSc. I created a poster with all the options and it allowed me to focus on the future and consider what I would like to pursue after an undergraduate degree, Lucia has allowed me to develop skills which will not only be helpful at undergraduate level but also in my work at A2. An example of this is source analysis. I used the ‘CARS’ checklist for to analyse five different articles on ‘The Teenage Brain’. I had to evaluate the credibility, accuracy and reliability of the sources and comment on what made each source different to and better or worse than another. Working in a research environment exposed me to experiences that I would not have had otherwise. As well as working alongside Lucia, I worked with a Birkbeck psychology undergraduate student who I was able to talk to about what to expect from a psychology degree and I worked with her during data collection and analysis. I was also able to sit in on a meeting between research colleagues. One PhD student shared his preparation for a presentation on his own experiment that he was to deliver at a conference. His colleagues gave him feedback and I was able to witness first-hand how research presentations develop and how the format and style in which they are presented. My experience at the iDCNlab and the MoBeLab has been a perfect introduction into psychological research and has inspired me to start building skills that are not only helpful in psychology but in all aspects of study. These skills include scientific writing, mathematics, source analysis and programme coding. I will now be able to transfer these skills into my work during my sixth form year and carry them through to university and beyond. This remarkable opportunity has challenged me to improve myself in all academic areas and has motivated me to push myself in order to achieve academic success. Find out more about the labs and the research that I have been involved in on their websites.